Check out our Military Discounts!! Your choice of select anchovies, fresh onions, garlic, green peppers, mushrooms, and spinach, are flavorful additions to our authentic Mediterranean recipes. You are invited to order you pizza to satisfy your personal taste. Our 2 sizes of pizza, 16" large or 10" small, are proportionate to satisfy any appetite. And Olivia’s is not just about pizza and calzones. A mouth watering selection of the freshest salads, hot and cold subs, fresh Atlantic seafood, select jumbo chicken tenders, baked pastas, specialty dinners, and a fabulous Kids Menu will keep you coming back time and time again. 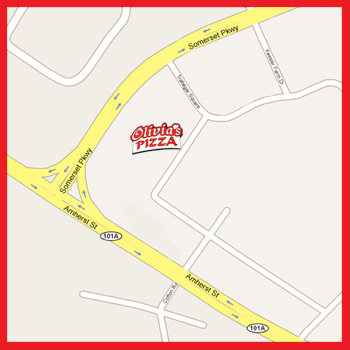 So whether you want to dine in, order takeout, or experience our prompt delivery service, Olivia’s Pizza & Family Restaurant will delightfully satisfy. We offer a variety of Coca Cola products. Copyright © 2009 Olivia’s Pizza - Nashua NH, All Rights Reserved.